If you’re anything like us, your grill had been fired up and raring to go since the first hint of summer. 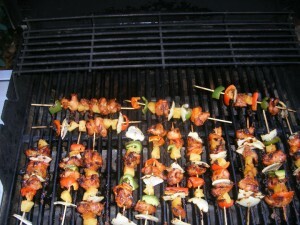 In case you’ve run out of normal/edible/safe things to throw on the grill, this blog is for you. We’ve rounded up a mighty fine list of delicious grill-able foods that DOES NOT INCLUDE burgers and hot dogs. Not that there’s anything wrong with conventional… Have some fun experimenting with these great grilling ideas before and after the 4th of July, and let us know how it goes! -Cheese: Unless going for a grilled cheese sandwich, we’d recommend grilling Halloumi, a cheese made from a mixture of goat and sheep’s milk (although some halloumi can be bought that also contains cow’s milk). It has a high melting point, so it can stand up to the grilling test! -Fava Beans: Whatever you season these little guys with, will end up sticking to your fingers in the most delicious way. The pods get a bit charred, but become really easy to open. Open the pods and slip the beans out, pinching off the skin with your fingernail. Make sure the grill isn’t too hot, or the pods will char before the beans have time to steam! -Figs: Cut in half before placing on the grill. Some like to toss in balsamic vinegar first, others prefer feta and basil. Check out this GrillinFools method (used on pears) for a mouthwatering prosciutto wrapped skewers with cheese! 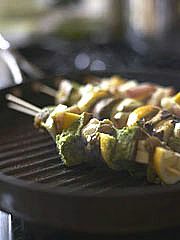 -Olives: Marinate pitted olives before sliding on a skewer and grilling about 1min per side! It’s that easy! -Nuts: Simple spiced and smoked nuts (like almonds) should be grilled in foil with low heat coals (maybe after grilling an entrée) to avoid burning the nuts. We recently received a tip from a cookie expert, recommending we try starting cookies (like these turtle cookies) on the grill, allowing for the nuts to get that smoked flavor, then finishing in the oven. Great idea! -Avocado: Cut in half, remove the pit and brush the cut side with a teeny bit of oil. Grill (cut-side down) for a few minutes. Stuff as desired, and enjoy! You can also use grilled avocados to make a delicious guacamole! -Tomatillos: Cut in halves and grill (cut-side down) until browned on the bottom, then flip. Remove when soft all the way through. Great for salsa with a smoky flavor or a guacamole like this one! -Romaine Lettuce: It’s not as crazy as it sounds! Dress with oil and balsamic vinegar, then char over a flame…Yum! 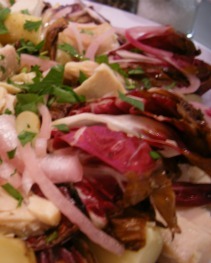 – Radicchio: Cut the head of radicchio into 6 wedges before you drizzle with olive oil and sprinkle with salt and pepper. Grill radicchio over moderately low flame on each side, until just charred. Remove and add balsamic vinegar, salt and pepper as needed. – Endive: Paired with radicchio, makes a great salad! Slice off the bottom of the endive, cutting away the tough, woody part of the bottom. Make sure to leave enough of the base for the endive leaves to stay connected! Brush with olive oil and sprinkle with salt and pepper, then put the endives on the grill, cut side-down. Grill until the edges are well browned and curled. Remove and add balsamic vinegar, salt and pepper as needed. -Watermelon: Yowza! This simple Claire Robinson (Food Network) recipe for a Grilled Watermelon Salad sounds too good to pass up! 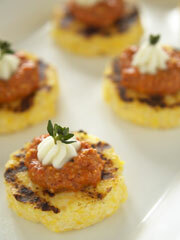 -Polenta: A great side to many a picnic or potluck dish, brush with a little olive oil and earn those grill marks! -Quesadillas: No microwave allowed! We’ll take a crispy, perfectly toasted tortilla over a flimsy one any day! -Pizza: Due to the quick- grilling nature of this dish, these tips and tricks from a Serious Eats – Slice article will sure come in handy! -Oysters: Scrub the oyster shells under cold running water with a brush. Live oysters will be tightly clamped shut, or will clamp shut when tapped. Discard any open shells, as the oyster is dead and not edible. 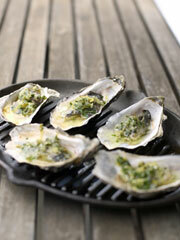 Check out this great Barbequed Oyster Recipe! -Herbs: Wrapped in foil, used as a skewer (make sure to use woody herbs, like rosemary), placed underneath meat on the grill, or placed straight on mellow coals with the lid closed – there’s no wrong way to infuse flavor into your grilling meats! The Herb Companion’s Barbra Annino even put together this helpful guide to herb-meat pairings! -Peaches: It’s best to start with peaches that are pretty firm. Too ripe, and they’ll fall apart on the grill! 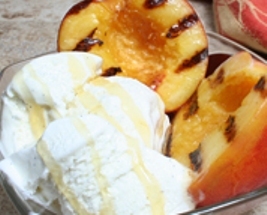 Grilled peaches are great with a little balsamic vinegar and brown sugar, or with yogurt and honey, OR go all the way and add vanilla ice cream. Yum! -Bananas: Great on the grill when sliced lengthwise down the middle! -Angel Food Cake/Pound Cake: Pretty much speaks for itself. Dare we suggest adding the grilled peaches to create a masterpiece?